My stay at this vacation rental left me wanting nothing more than to pack up and move in immediately. This beautiful old house has been brought to life with a masters decorative touch and feel that one could only dream of creating in their own home. The comforting space that the owner uniquely crafted leaves visitors helpless to surrender to instantaneous relaxation. Complete with the signature scent of BeeCrowBee, you will find contentment in any of the rooms, which include three cozy bedrooms as well as living room and activity areas. The charm of the two-story home overflows and spills onto the land surrounding it. The location is perfect for any visitor who truly wants to get a real feel for Joseph, Oregon since it is a short walking distance from any attraction in the town. Although the vacation home is directly on Josephs main street, the backyard is a secluded world all your own. A spacious second-story balcony can be accessed through picturesque double doors in one of the bedrooms. The balcony overlooks lush greenery, complete with a cute babbling stream. The beauty of the backyard setting can only be attributed to the natural beauty of the Wallowa County outdoors. There is a great game room located in the backyard as well. Apart from the endless hours that I could spend lounging with friends and family on the balcony, my favorite thing about my stay was waking up inside a cloud. The beds are so comfortable and the sheets so down, that I completely lost myself in sleep. It was only when I woke up and was greeted by the calm, refreshing aroma of the home that I realized I hadnt died and gone to paradise, but that I had actually found a little piece of paradise on earth. 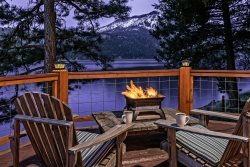 I would recommend this vacation rental to any visitor that desires to get a feel for the town itself in addition to Wallowa Lake, or to the traveler who wishes to relax in an uninterrupted, serene environment, inside and out. Kyrie W.
We loved the cabin, it was very charming and relaxing. The little creek outside was a great surprise. The hot tub was the perfect place for star gazing! Cindi always goes the extra mile. Knowing that I was celebrating my 40th birthday, she left me a wonderful surprise to help me celebrate. We were lucky enough to get to be the first guests in this home, which was a treat for us as we were the plumbing contractor also. It is every bit as comfy and cozy as the pictures show with all the modern conveniences. The view is wonderful right along with the lake access. The Team Members were very helpful & friendly. Where do I beginthis cabin was FANTASTIC. My husband and I along with our 1 year old daughter joined two other couples for Memorial Day weekend. The cabin was clean and well stocked and perfectly set-up for a family/friends get away weekend. The kitchen has absolutely everything you need, including paper plates, plenty of cooking pans and utensils and ample counter space for breakfast and dinner buffets. The living room was comfortable for watching moves or playing cards, after dark. The best part about this cabin is the deck. It is amazing. We grilled out every night, and our little one was free to roam, as the desk is very safe for smaller visitors. In addition to the amazing house, the lawn and dock were perfect places to play bocce ball and Frisbee. The highlight of our outdoor time, besides spending time on our boat, was the use of two paddle boards that we rented through Wallowa Lake Vacation Rentals. First off, the rental process was cake. It was an easy waiver to receive and return prior to our visit. That also allowed for the paddle boards to be ready and waiting upon our arrival. These paddle boards exceeded our expectations. I have used the flimsy inflatable ones in the past, but these were the real deal. Both boards came with a paddle, life jacket and whistle and were delivered to the house, super convenient. They were in perfect condition and were very stable for the beginner paddle boarders in our group. We used them both days and everyone was able to paddle them around in front of the house. I would highly recommend renting the paddle boards as this provided a great outdoor activity for the whole group to enjoy, and the cost was very competitive (especially with the added bonus that they are delivered to your door)! I cant thank Wallowa Lake Vacation Rentals enough for the perfect kick-off to our summer. One more thing, the cinnamon rolls that were delivered were TOP SHELF. We warmed them in the oven the first morning and they were absolutely delicious. This weekend has set the bar extremely high for the remainder of our summer. Wallowa Lake Vacation Rentals was very good at solving issues by phone even in the evening hours. We loved the trees and the privacy they provided. Some people have left comments in the Guest Book that they need thinned out, but we loved them! There is a great view from the lower deck that is more open viewing to the lake. Absolutely beautiful! Peaceful and relaxing. Spent most of our time on the dock fishing and paddleboarding. Such a wonderful place to stargaze! Thank you!